Hair stylists in best hair salon (beauty salon), once called hairdressers have used a variety of beauty tools through the ages. 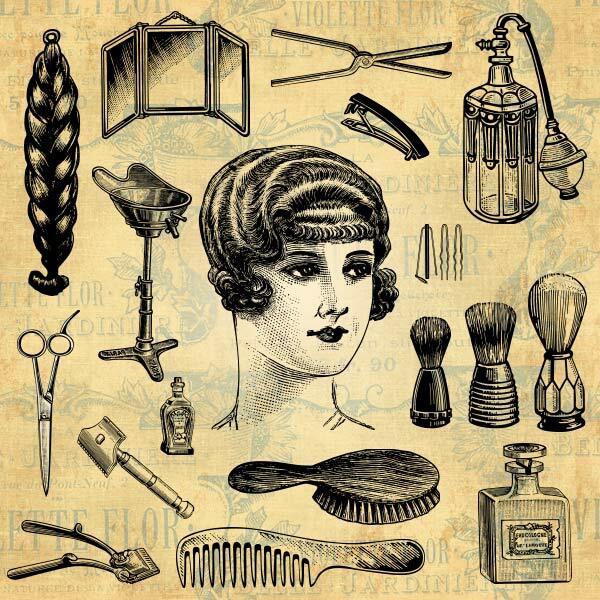 This large collection of vintage salon design vectors could be perfect for your next design. There are 50+ hair salon / barber (mens haircut) design vectors in this free download – scissors, combs, a hair brush, perfume bottles, razors, hair extension, a hair wash station, cremes, a 3-sided mirror, shaving cream brush, bobby pins and barrettes. Oh and there are barber shop/men’s haircut, grooming and style elements like shavers, straight razors, suspenders, collars, kerchief, stop watch, shirt, shoes and socks. Proper! In Bloomington or anywhere.